One of the most annoying things about this movie (possibly apart from the movie itself) is the amazing amount of myths that seem to have grown around it. The great majority of these have absolutely no basis in truth. One of the reasons I created this site was to kill off those myths. In this section I have collected a lot of the stories and quotes I have read about the about the film and debunked them. For the full story on the production of film, please follow this link. This section is meant to be an overview of the site and kind of act as a sort of FAQ on the movie. Please see other sections of the site for expanded details on the film. If you have any more misconceptions on the film or want to correct me, please feel free to email me. The movie is called "The Untold Story"
Only on the very cut down version the film that appears on A&E Entertainment’s 2011 complete DVD box set of Robotech, does the movie’s title card say this. The inclusion of the subtitle “The Untold Story” can only be found on this release. On every other release of the film prior to this one, nowhere, not on any video release or the movie's title card does it say "The Untold Story". The only place these words appear is as a by-line on the US theatrical poster and some of the rarer English language promotional material. Admittedly the US theatrical poster does make it look as if the movie is called "Robotech the movie: The Untold Story" (along with the fact it wasn't distributed widely in English speaking territories), so this is where the confusion probably originated from. "Macross Do You Remember Love?" was the basis of "Robotech the movie"
As the Macross TV series was the basis of the first third of the Robotech TV series, people seem to assume that the Macross movie was used for the Robotech movie. The Macross movie was dubbed (very poorly) into English and has been released in various countries under the names "Clash of the Bionoids" and "Super Dimensional Fortress Macross". This dubbed version is assumed by some to be the Robotech movie. Of course Megazone 23 was used as the basis of "Robotech the movie" with some footage of "Southern Cross" spliced in as well. I think people get mixed up here with the third arc of Robotech which uses Mospeada and the second arc which uses Southern Cross. It’s definitely Southern Cross footage inserted into the movie. This may be a bit more of a subjective statement, but I still think it’s rubbish to be honest. First and foremost everyone knows that the "Robotech" TV series is made up of three unrelated series, all with different character and mecha designers, so what the hell is the difference here? Secondly "Megazone 23" has some very similar elements to "Macross" (which made up the the first arc of Robotech); the idol singer, transforming mecha and there's a city inside a spacecraft in the middle of space being attacked by an alien enemy. We also have transforming motorcycles, just like in "Mospeada" (the TV series used as the third arc of "Robotech"). Third, a great number of the crew who worked on "Macross", worked on "Megazone 23", most in the same jobs; Noburo Ishiguro was director on both, Haruhiko Mikamito who did the character designs on "Macross" did the designs for Eve and Toshihiro Hirano did the rest of the character designs. His work on this OVA was noted as being "more Mikamito than Mikamito" in terms of his designs. We also have Ichiro Itano who reprised his "Macross" role as an animation director, giving us the absurdly detailed mecha and action sequences that "Macross" made him famous for. So in short, "Megazone 23" looks and feels more "Macross" than any other part of the Robotech franchise. I can only assume that people are getting one "B Movie" studio mixed up with another one. The movie's credits, poster, TV advertisement and trailer and video releases all credit Cannon Films as producer and distributor of the movie. The movie was released in 35 theatres in Dallas, Texas on 25 July 1986 for at least three weeks, shown publicly at an Los Angeles animation film festival the following year, released in cinemas in Argentina in 1987 and released on home video in various countries in Europe as well as Argentina (see below for details). There are theatrical posters, TV commercials, press advertisements, newspaper reviews and even footage of Carl Macek promoting the film on a local Dallas TV programme, Point of View (which is available as an extra in ADV Films and Madman's Robotech box sets). This provides more than enough evidence to prove that the film was actually released. According to the film's entry in the book "The Animated Movie Guide" by Jerry Beck, the movie received a 7 out of 10 score in a review from the Fort Worth Star-Telegram, the only paper in the region to review the film. In the September 1986 Lone Star Comics newsletter, "The Lone Star Express", Derek Wakefield wrote a very favourable review in his anime column "Banzai!" and noted that the film "had several good reviews by critics". In a 2010 interview, Carl Macek stated that the film did quite well against two other films touted as blockbusters which opened around the same time; James' Cameron's "Aliens" and Roman Polanski's "Pirates". Macek explained; "It did exceptionally well at the box office [...] 'Robotech the movie' beat the hell out of 'Pirates', and did respectable against James Cameron's 'Aliens', which was amazing to me. It did really well". The true reason the film was pulled from distribution was that Cannon Film wanted to market the film towards children and discovered that mostly adults were watching the film. Cannon suffered financial difficulties before the film could be retooled or the marketing changed. As a result the film was shelved. Completely untrue. It was released on VHS tape by Rank Home Video in the United Kingdom in 1988, Vestron Video in Belgium in 1988, Tauro Video in Argentina in mid 1987 and Sandrews Video in Sweden in 1988. It was also released on Laserdisc by Cascar Video in the Netherlands and Belgium in 1991. I personally own an original VHS copy of the UK Rank Home Video version. Please see the Video Releases in English section for more details and Other Foreign Merchandise section for foreign language video releases. Considering how many times that version of the video has appeared on eBay over the years, I highly doubt this figure. I would suspect at least a couple thousand copies were manufactured in the UK for the rental market. But it has been over 20 years since the video was released, so there can't be that many copies left in existence today. Naturally original copies of the film are much scarcer now. I have lived in Australia all of my life and have never seen a copy of the film available in any video shop, and video rental shops were one of my favourite haunts from the 1980's to early 1990's when I was a kid. I have never come across any evidence that it was released here nor know of anyone who has an Australian released copy. The film is not in the Office of Film and Literature Classification database either. While a lot of material relating to Robotech was destroyed or damaged in a flood in the mid 1990's, and perhaps some material relating to "Robotech the movie" was destroyed, we know via the extras A&E Entertainment’s 2011 Robotech DVD box set that a copy still exists of the film (from which they edited their version for the box set). The extras on that box set as well as the ADV Films Robotech DVD Box Sets proves that most, if not all of the material relating to the movie has survived. Add to that the comments made by Macek that anyone could release the film (it's just that he doesn't want to be the one to do it), and John Ledford of ADV Films said that they considered releasing the film as an extra but in the end didn't. They also considered the possibility of a releasing it as a single disc but they apparently decided that it wasn't financially viable (this has been reiterated at a number of ADV panels at US anime conventions). According to one convention report, Ledford said he made a DVD-R copy of the film off Harmony Gold's master for his own personal collection. Mike Toole also noted in 2012 that he has seen a recent photograph of the film masters. I saw this claim on a Robotech Wiki, and there seems to be no truth to it whatsoever. The Wiki cites Carl Macek's 2010 interview on ANN Cast (at Anime News Network), for this claim, however listening to the entire interview, not once does Macek mention his like or dislike for the film. He just presents the facts about the film and states he liked working on the audio aspect of it. In the 1990 "Importing Robotechnology" article by Bob Miller in Animato! Magazine, there are several choice quotes which show what Maceck really thought about the film including; "[It was] the worst experience of my professional career", "I was actually glad it never got a broad release because to me it was an abomination" and "I don't consider [the movie] to be a part of the timeline of the 'Robotech' era whatsoever. Really, I'd like everybody to forget about 'Robotech the movie' altogether [...] I am not anywhere near impressed with it". I am still unable to find any interviews or quotes from Macek showing that he didn't have anything but utter contempt for the finished film. With even the pilot film for "Robotech 3000" being released on DVD (as an extra on the special edition of "Robotech: The Shadow Chronicles"), one wonders why "Robotech the movie" has never been released. Even though it may arguably be the worst part of the franchise, surely it can't be that much of a financial risk (or embarrassment) to release. 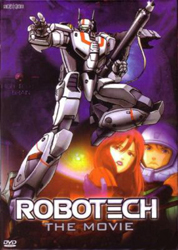 This is not a bootleg of "Robotech the movie". Instead it is a bootleg of "Robotech: The Shadow Chronicles", confusingly with a Macross Valkayre on the cover (which doesn't appear in either film). Mudding the waters further is the fact the synopsis on the back of the DVD package is taken from the opening scrawl from "Robotech the movie"! Despite this I can guarantee you that not one nanosecond of "Robotech the movie" appears on this DVD. In short, any DVD you see which purports to be a legit version of "Robotech the movie", isn't. Most are poor DVD-Rs with video taken from multiple generation copies of the UK VHS release that have been converted from PAL format to NTSC. As you can imagine, they don't look that great.